Some of the many designs of brooms in Henry Tschetter's shop. 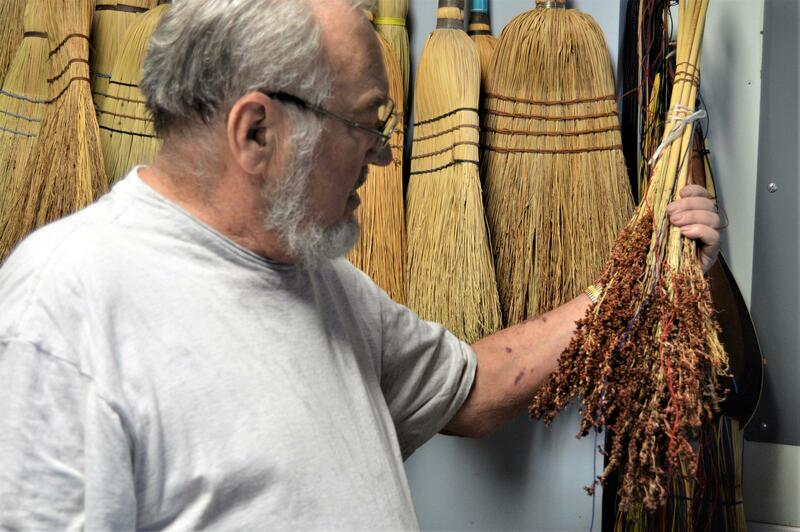 Unlike his father, Henry Tschetter makes many different designs of brooms. The middle broom uses a forked limb as a broomstick. Henry Tschetter uses branches, golf clubs, gun stocks, deer hooves, rolling pins, and many other items as broomsticks. 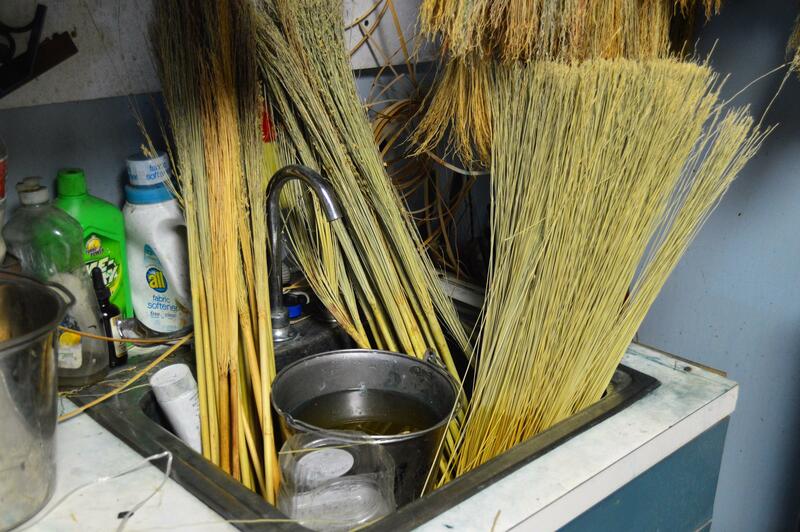 The broom with the blue handle (on the right) was made while the interview was conducted. Henry Tschetter of Brooms by Henry talks about the long history of making brooms in his family. 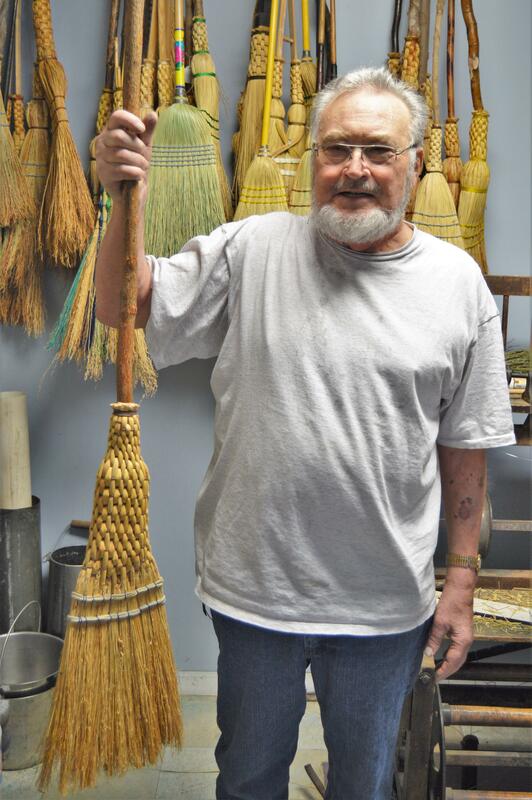 While his father and grandfather made a handful of standard brooms over and over again, Henry Tschetter makes a wide variety of brooms from the practical to ornate. “When I was eight years old, my dad told me, ‘Henry, one second after school I want you in the broom shop.’ Well, he did that for a reason because I was a mischief maker, all the time getting into mischief,” he said, laughing. “And he kept his eye on me. I couldn’t get into mischief. And to this day it still keeps me out of mischief,” Tschetter said. Not only did his father make brooms, but his grandfather also made them. He is a third generation maker of brooms. You may know that a person who makes shoes is a cobbler and a person who makes wood barrels is a cooper. What’s a broom maker called? A broom-squire. Tschetter has a few newer machines, but mostly he uses antiques. A de-seeder, stitching press or vise, and a broom-winder. Some of the machines Henry Tschetter uses are a century old or older. “I use my foot-powered machine,” he said. Tschetter says he does have an electric broom-winder, but he doesn’t use it that much. The foot-powered broom-winder gives him a lot more control. That’s where he started making a broom while we talked. He does everything right on his property. He even raises the broom corn used to make the brooms. Broom corn before it is de-seeded. 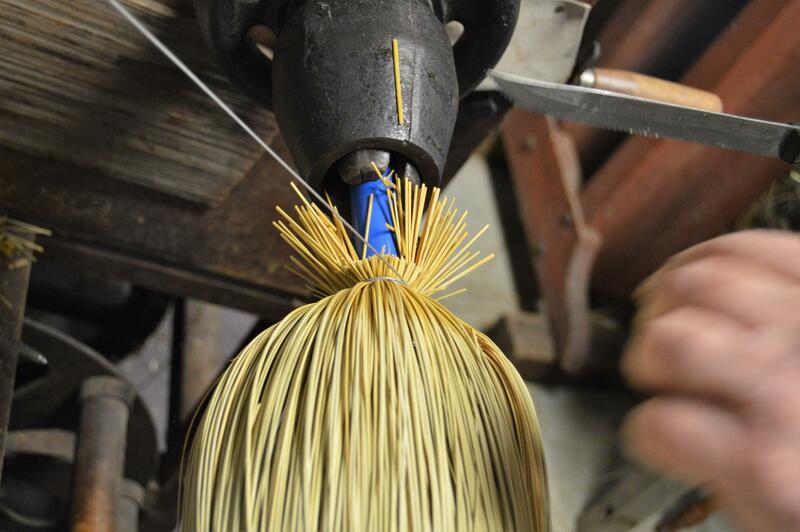 Keeping the broom corn moist during the process is necessary to avoid the wire cutting into the material. Brooms last longer if they're moistened occasionally. He says if you treat a natural broom well, it will last a long time. All his brooms are made to be used, but some of them are so ornate it’s clear they’re going to end up hanging on someone’s wall. “If people use them for decorations, that’s fine. Just so they don’t abuse them and come back and tell me they fell apart or something. I’ve only had two brooms came back,” he said. “One lady, she asked me, ‘How long shall this broom last?’ And I told her five or six years at the very least. She brought it back to me six years later and she told me, ‘Henry, your broom that you made for me, told me it was going to last six, seven, eight years, is all wore out.’ So, I told her, ‘Lady, I’d like to see the broom.’ And she brought it back. It was worn down all the way to the stitching strings. I asked, ‘Lady, what did you do with that broom?’ It looked like she took a knife and just cut it off. She told me she sweeps the sidewalk at the street, both sides of the street in the morning and in the evening every day. On the concrete. Concrete is very hard on a broom. And I told her, ‘Lady, I sold this as a house broom,’ which is fine. I gave her another broom. You can’t argue with a customer,” he explained. “And then, another guy brought a broom back. ‘Henry,’ he said, ‘your handle broke.’ I said, ‘What did you do?’ He said, ‘I was just sweeping and the handle broke.’ Well, a little girl about eight years old spoke up and said, ‘Dad, you hit a cat with it,’” he said with a laugh. Trimming the excess as the wire holds the several layers of the broom corn to make the broom. As Tschetter worked, he kept winding a wire tight around the broom handle, strategically placing the broom corn. He noted that his father made the same standard brooms over and over again. He does not. He’s used just about everything you can think of as a broom handle: clarinets and trombones, gun stocks and deer hooves, rolling pins and then some of the broom handles are simply the broom corn braided or braided up the shaft of a handle… like the one he wanted to show me. “This one is a broom I sent in to be judged, to Arcola, Illinois. 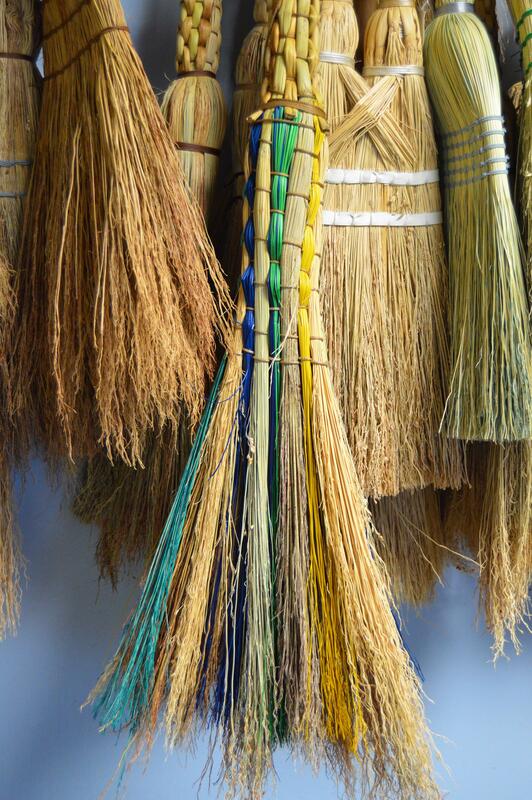 Every year a bunch of broom makers send a broom in to see who can make the fanciest, sort of latest style broom. And 2015 I sent this broom in and I won first prize, $500, with this broom,” he said matter-of-factly. Henry Tschetter's nationally award winning broom design. So, Henry Tschetter is a nationally recognized broom-squire. He owns Brooms by Henry. And he’s our latest Artisan of Michigan. You can look at some of the many broom designs in the slide show above. We found this artisan via the Michigan Traditional Arts Program of the Michigan State University Museum. Support for arts and culture coverage comes in part from the Michigan Council for Arts and Cultural Affairs.